Who Could Be Responsible for Compensating You in a Jackknife Truck Crash? A jackknife truck accident can be especially dangerous because the semi’s trailer swings out to the side and forms a 90 degree angle with the cab. When this happens, the trailer will move into multiple lanes of traffic right into the path of oncoming vehicles. Multi-vehicle collisions are not uncommon. There can often be several negligent parties, and it is important to identify them all to ensure that you are fully compensated for your injuries. When a trucker is speeding, taking curves too fast, not driving for weather, or engaged in distracted driving, he can lose control of his truck and cause it to jackknife. These are just some negligent driving practices that lead to these tragic wrecks. 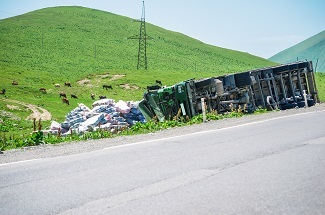 In Texas, trucking companies are vicariously liable for the negligent actions of its employees. In addition, you may have a separate claim against them for lack of truck inspections and maintenance, negligent hiring, negligent maintenance, and more. If the cargo was not loaded or secured properly, this could cause it to shift and the trailer to swing out into other lanes. In this case, the shipper may be responsible for compensating the victims. Many trucking companies contract with a maintenance facility to inspect, maintain, and repair their fleet of 18-wheeler trucks. If a maintenance problem caused your jackknife accident, you may be able to file a claim with this supplier's insurance company. Defective brakes, tires, and other truck components can also be the reason that a truck driver loses control of his truck. If this was the cause of your crash, you may be able file a products liability lawsuit against the truck and parts manufacturer. If you or a loved one was injured or killed in a truck collision in the Dallas/Fort Worth area, our experienced truck accident attorneys are here to investigate the cause, identify all liable parties, and negotiate settlements with their insurance companies on your behalf. It’s easy to schedule a free consultation today. Simply contact us online or call our Colleyville office directly at 817.380.4888.